Looking around the Plant Centre and Garden you can see that the momentum of spring has started. Buds are starting to swell and break and all sorts of plants are coming into flower. This is true of a lot of the acid loving (ericaceous) plants which tend to produce early spring flowers. 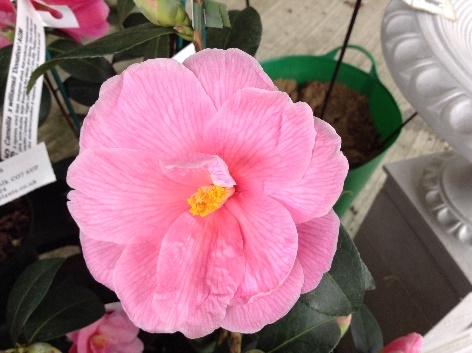 Camellias are a favourite of mine with their myriad of colours and flower shapes. The single flowered forms are the first to open followed by the double and bi-coloured forms later in the month. Camellias produce their waxy looking flowers over several weeks and so will still be going into April or May, especially if we have cooler temperatures without frosts. 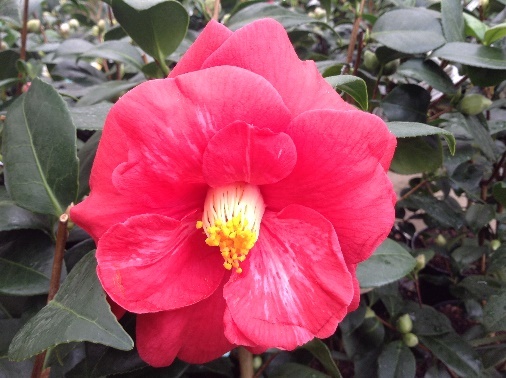 Camellias should be planted in a west facing position as this helps to reduce the risk of frost damage to the flowers when they open. Damage is caused by the sun warming the flowers up too quickly causing the frost on the flowers to melt fast burning the petals. In a west facing site the sun takes longer to get to that position and therefore the flowers have de-frosted more slowly and therefore no burning occurs keeping them perfect. 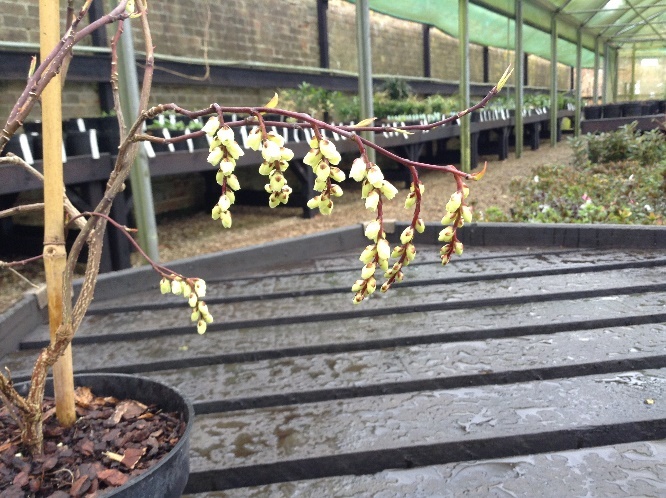 Another lovely acid loving plant in flower during the next month and into April is Stachyurus praecox. This elegant shrub gets quite big with time (up to 8ft or 2.4m) and needs a dappled shady spot in the garden. At this time of the year it produces slender drooping racemes (flower spikes) of pale sulphur yellow and cream which have a very light fragrance. These appear on the bare branches and so look stunning. The leaves will appear just after the flowers fade in April. Pieris are a good group in the acid family to get to know. 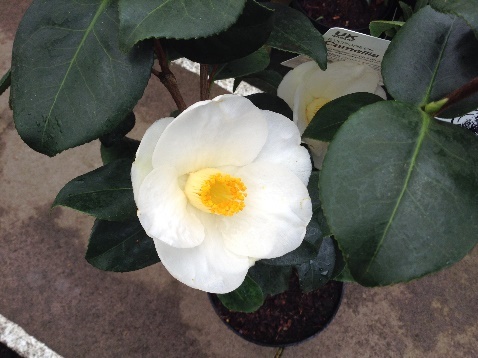 Being evergreen, like the Camellias, and producing masses of lantern-like flowers even on young plants. 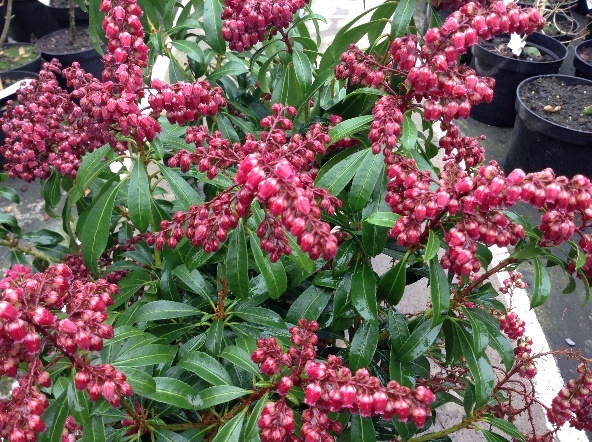 Pieris are ideal for growing in pots and, as long as they are grown in shade, they can grow in almost any garden. The flowers can vary in colour from ivory-white to bright vivid pinks. The new foliage that is produced each year starts off a wonderful flame red and fades to green with age. All in all another plant that has a good amount of interest for a long time during the year, well worth a try. The other plant I must mention this month is again one of my favourites for the woodland garden or shady spot; Corylopsis sinensis. 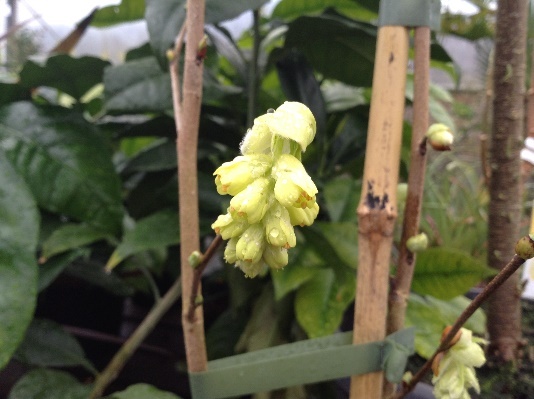 Corylopsis sinensis is another shrub which produces flowers on bare stems at this time of the year. Although this will grow in most soils compared to the others and so does need to be planted in a specifically acid compost. The bright conspicuous sulphur yellow flowers hang down from the branches in bunches and have a slightly spicy scent. This gets to roughly 6ft (1.80m) tall and produces rounded slightly serrated leaves which look very much like Hornbeam. It can be slow to get established but boy is it worth the wait when it flowers! When I plant an acid loving plant in a pot I always use a mix of ericaceous compost (specific compost for these acid loving plants) and some John Innes No2 or 3. This is because I have found over the years that if you just use ericaceous compost, the pot can retain too much water causing poor plant establishment and die back. Mixing the two types of compost together allows the best of both worlds I have found, allowing you to have the correct acidic compost for the plant with the benefits of the John Innes, which are better drainage and better nutrient retention, which in turn gets the plants established well. Seed sowing– now is the time for lots of things to be sown ready for the coming year such as Mangetout and Sugar Snap peas, Lettuce and of course flowers such as Cosmos and Cornflowers. When sowing your seed just sieve over enough compost for the seeds to disappear so that they do not get buried too deep. This will ensure good germination. Always read the seed packet first as some seeds do not want to be covered!! Seed potatoes– Get these chitted (placed in somewhere frost free in an old egg box is best, with the end of the tuber with the most eyes in it facing upwards) these will start to produce shoots from each eye and then when they are 2 centimetres in length get them planted out in the garden, or try growing them in pots or sacks. It’s a great way to get children interested in vegetables. Spring Open Weekend 25th and 26th March. 10am-5pm.